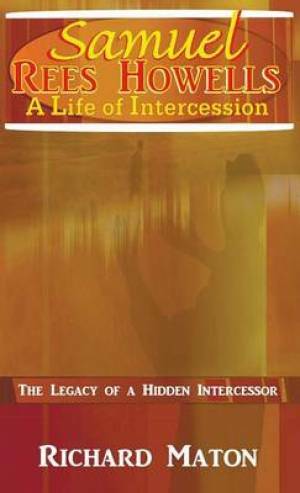 Samuel Rees Howells, A Life of Intercession: The Legacy of Prayer and Spiritual Warfare of an Intercessor by Richard A. Maton, Paul Backholer and Mathew Backholer. Hardback and paperback edtions have 39 black and white photos interspersed throughout the book. Rees Howells, a powerful intercessor, taught his son Samuel the principles of intercession and commissioned him some weeks before his death, stating, "Whatever you do, stand and maintain these intercessions." For the next fifty-four years, Samuel Rees Howells exercised a powerful intercessory ministry as he focused prayer on gospel liberty, in order for the good news of the Gospel of Jesus Christ to be given to every creature. With the mantle of intercession weighing heavily upon him, Samuel spent decades participating with others in their own countries, in profound spiritual struggles that shook world events and shaped history for God's glory! Discover how Samuel was led by the Holy Spirit to exercise authority over the principalities and powers, and to 'pray through' until God's purposes were fulfilled in many lethal world conflicts. Learn how God still intervenes in world history, from the Korean War to the Cuban Missile Crisis, and from the Six-Day War to the fall of the Soviet Union! Beginning in the days of Rees Howells, this book continues this powerful story of intercession and traces its effectual legacy into the twenty-first century. Filled with principles of intercession, faith and spiritual warfare, this book provides a fascinating insight into what is possible when the Holy Spirit finds an individual, who will stand in the gap and become a channel for His intercession. Ezekiel 22:30, Romans 8:26-27, Ephesians 6:12. Richard A. Maton worked under Samuel's ministry for forty-seven years and provides us with an eyewitness account of Samuel's life of intercession. Richard is married to Kristine who joined Rees Howells' Bible College in 1936 and prayed alongside him. Together Richard and Kristine spent more than 120 years at the College! Samuel Rees Howells, a Life of Intercession by A. Richard Maton; Mathew Backholer; Paul Backholer was published by ByFaith Media in December 2013 and is our 12723rd best seller. The ISBN for Samuel Rees Howells, a Life of Intercession is 9781907066375. Be the first to review Samuel Rees Howells, a Life of Intercession! Got a question? No problem! Just click here to ask us about Samuel Rees Howells, a Life of Intercession.